April 1st arrived with a few jokey videos and company announcements. It’s toned down compared to previous years. It may be that big companies like Google and Facebook understand that with privacy breaches, revelations that platforms often recommended extremist and fake news to maximize engagement, and breaking news when really bad actors (from pedophiles to terrorists) post content, jokes might not be that appropriate. Or maybe that’s just me. I do like fun updates, rather than “gotchas”, like Reddit’s collaborative GIF-based movie, the addition of Tulip-ese to Google Home languages, the Google Calendar space-invaders style method of clearing your appointments, and Google Maps Snakes game. There is a link roundup below. 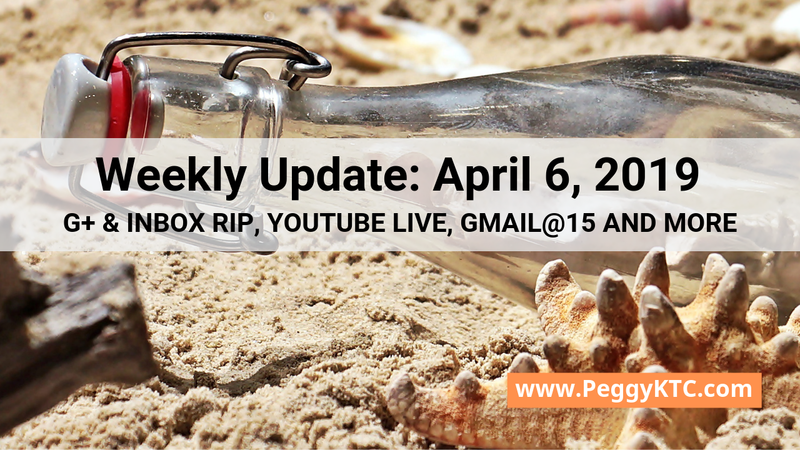 On April 2, Google+ shut down for consumer consumer accounts and Google+ Pages. If you have a G Suite account, you can continue to use Google+, but communities can only include other G Suite users and the focus is on using Google+ as a communication tool for your business or school. If you didn’t download your Google+ content, some may still be available for a short time. Check your Google Calendar and Contacts to see if entries need updating and sign in to your Blogger account to set up a Blogger profile. And note that some features that depended on Google+, like Hangouts on Air apps, may no longer be available. If you have questions or issues related to Google+, you can ask in the Google+ Help Community in the Google+ Help Center. I’ve also collected some of the many Google+ retrospectives posted this week below. Nina Trankova hosted a “Farewell Google+” live roundtable that I participated in, along with Monika Schmidt and moderator Azlin Bloor. Inbox by Gmail also shut down on April 2nd. If you are missing it, you might want to try the “Simply Gmail” Chrome Extension by Michael Leggett. Leggett was formerly a lead designer for Gmail and co-founder of Inbox by Gmail. Gmail turned 15 this week, and as a birthday gift there are new features, including the option to schedule emails for future delivery, changes to the way messages are threaded, and “Smart Compose” subject suggestions and personalization. You can now embed MP3 and WAV audio files stored in Google Drive into your Google Slides presentation. It’s easier to get help and information in Gmail, Calendar and Drive on desktop. Just click the new ? button at the top of the page for support options. Google Docs, Sheets and Slides now also has “Training” and “Updates” options in the help menu. YouTube increased the eligibility requirement for mobile live streaming to 1000 subscribers. Since the end of 2017 this feature has been open to most channels in good standing, so this is a significant change. Team YouTube has started a new series with an update roundup video on their channel in the first week of the month. March’s updates included news about monetization, copyright, and section A13 of the European copyright directive. Bloomberg reporter Mark Bergen published an damning article about how YouTube’s focus on “Engagement” above all else allowed extremist content to flourish, despite concerns by employees. They even proposed paying YouTube Partners based on video view time, rather than ad views and clicks, especially in order to reward creators with videos that included non-advertiser friendly content. That change never came to pass, and as the article points out, “it could have rewarded videos that achieved popularity achieved by outrage”. YouTube’s response to the article was to point out that they have spent the last two years trying to fix issues with bad content. If you are using a custom WordPress or Blogger theme from Pipdig, read this article that looks at what obfuscated code may be doing (bad things) and consider switching to a different theme. The Google Play Artist Hub - used by indie musicians without a record label - is shutting down April 30, and any content uploaded through the hub will be removed from Google Play Music. This is in “anticipation” of the replacement of Google Play Music with YouTube Music. Adobe updated their image, video and audio editing software with new artificial intelligence “Adobe Sensei”-driven features, including content-aware fill in After Effects, better puppet rigging in Character Animator, a Freeform Project panel to organize and storyboard your media and new Rulers and Guides to add titles and graphics in Premiere Pro, and Auto Ducking for Ambience to create audio mixes in Audition. Snapchat got a major update, introducing Snap Games, Snap Original Programming, updated Lens Studio, App Stories in 3rd party apps (like Tinder and Houseparty) and Custom Stickers from your favorite services. Skype doubled the number of possible participants in a video call from 25 to 50. That’s a lot this week! But there’s more. Read on for more links, tips and updates for video creators, webmasters, social media gurus, live streamers and much more. This will probably be the last week the update will have a separate Google+ section. In the final days there were many farewell posts and private goodbyes, now gone. RIP. Watching your Farewell with Nina is heartbreaking. As Azlin said - gone, all gone. It was really not a fun reason to get together :( But our connections are outliving Google+ and that, at least, is something to be happy about. I do have a question....so for my Gmail accounts, they are still showing as Gmail having its birthday and turning 15 and I still see my upper left hand side of Gmail looking not normal. They have remained this way since literally April 1, 2019 which was 5 days ago so this problem should have been fixed by now (unless they are busy focusing upon the consumer Google+ shutdown and figuring out how G Suite Google+ will pan out). How long will this take for Gmail to go back to normal without weird stuff on the upper left? How long does it take one thing product to have a birthday? In the country I live in, birthdays normally only last for one day and only are celebrated on one day (especially if you are cauasian or African-American).